Signed from Portsmouth in the summer of 1988, on a free transfer by Billy Bremner, Noel Blake made 62 appearances for Leeds United and he's still fondly remembered by the supporters who witnessed that era. 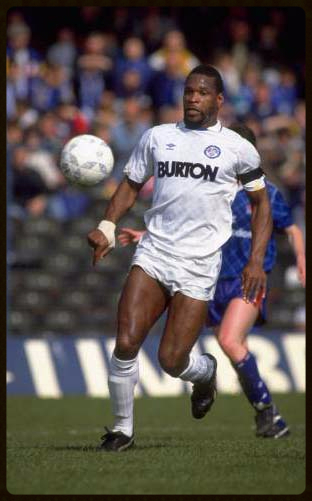 Noel was born in Kingston, Jamaica and following spells with Sutton Coldfield, Aston Villa, Shrewsbury Town (on loan), Birmingham City and Portsmouth, he became the first West Indian born player to play for Leeds. “I played at Elland Road on a few occasions but it was in the 1985-86 season that I remember the visit for the wrong reasons. Leeds won the game 2-1 with two Lyndon Simmonds goals but I received some terrible abuse from a section of the Leeds fans. “As a kid I had followed Leeds, they were my ‘second’ team behind Birmingham City and the treatment I got that day hurt me, although I must admit, I had to put up with racist chants most weeks and that’s how it was back then. “When the opportunity came to sign for Billy Bremner, God bless him, it was one I couldn’t refuse. I asked myself, ‘Do you shy away or do you face the challenge?’ I faced the challenge and signed for the club and it was a real pleasure to play for Leeds United. I never had a single problem with the supporters during my time there, they were superb with me. “Vince Hilaire also joined that summer and we went out into the community, educated people, broke down the barriers and laid some strong foundations and that was something I am extremely proud of." Blake was hard but fair. Opposing centre forwards knew they would be in for a torrid afternoon and I know that Bairdy was happy to have Noel on his side when the pair were together at both Portsmouth and Leeds. Every time the centre back made a crunching tackle, an affectionate chant of ‘Bruno! Bruno!’ would ring around Elland Road. In addition to his duties in the back four, he also proved quite handy at the other end as he weighed in with four goals during the 88-89 campaign. Noel’s last appearance for Leeds came against one his former clubs, Aston Villa, in the much maligned Zenith Data Systems Cup. A game which Leeds lost 2-0 and Blake was played at right back. “I had only made seven league appearances during that promotion season and I had the chance to go to Stoke City and team up with Alan Ball which again, I couldn’t refuse. Although Leeds sat top of the league and Stoke were bottom, needing snookers, I just wanted to play every week and Bally was a very special person to me – I wanted to help him out. “Howard asked me to stay and told me that the club would be in the First Division the following season but I had never experienced prolonged spells of sitting in the stands and Stoke presented me with a good opportunity and I firmly believe that in life, things happen for a reason. "There was no fall out although I had a little pop at Howard via the press when I left and that is something I will always regret. I was immature and one piece of advice that I pass on to any player today is that when they leave a club, they keep their mouth shut and get on with it." “The passion and drive around the place was always incredible. To walk from the tunnel onto the pitch with the crowd applauding us and ‘Marching on Together’ being played and sung was fantastic. Words can’t really explain my feelings towards the people and the football club and even today, where ever I go and Leeds fans recognise me, they call me Bruno. “The place was full of top people with great characters, Bobby Davison, David Batty, Gary Speed, Ian Baird, Gary Williams, Vince Hilaire, John Sheridan, Mike Whitlow, John Stiles and Gordon Strachan to name a few. “Training changed when Howard and Mick Hennigan came in, we worked much harder but it was still enjoyable. The banter around the place was relentless and Vince (Hilaire) and Nobby (John Stiles) were like Morecambe and Wise. “Gordon was a top man and a brilliant player. He did the job he was brought in to do and more. On and off the field he was a top class pro and had the respect of everybody due to his approach, what he brought to the team and his leadership qualities. “David Batty went on to become the best holding midfielder in the country. John Sheridan was another great player. He didn’t last too long under Wilkinson but he was blessed with tremendous ability and although Gary Speed excelled in his attacking midfield role, he was also a useful centre half. He played in that position with me on many occasions for the reserves and he hardly put a foot wrong. Thank you to Noel Blake for giving me his time and the opportunity to write this article.